UK Inflation CPI Rises to 2.5% for 2009 UK Election? UK Inflation as measured by the CPI Index rose to 2.5% for February, however the rise was wholly due to a change in the way the index is calculated without which the CPI would probably have remained unchanged. The more accepted RPI inflation index remained unchanged at 4.1%. 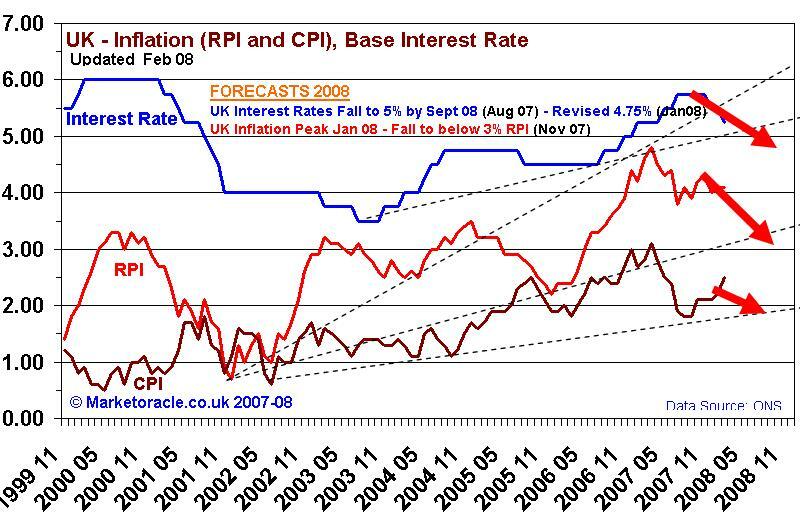 Therefore the artificial boost to the CPI suggests the intention for the creation of a spike in UK CPI inflation now which will leave the indices in 12 months time, thus resulting in a drop in CPI inflation and hence have the prospects for interest rate cuts in the lead up to the summer of 2009, which could present Gordon Brown with an ideal opportunity to go to the polls. The Market Oracle forecast is for a downtrend in inflation towards 1.8% CPI and 3% RPI by November 08 as of November 07. UK interest rates are expected to be cut to 4.75% by September 2008 as per Sept 07 revised lower in January 2008 , following the US Panic rate cuts. The schedule for the next rate cut is for May 08, and despite the deep US rate cuts, the next UK rate cut still remains on target to occur in May 08.